Observations and informal walk-throughs are an unavoidable part of being a teacher. And the anticipation of these events can make even the best veteran teachers nervous. Sure, some teachers don’t mind being observed, while the rest of us are nervous because of the audience in the room. Regardless of how you feel, there are several things that you should consider so that you are prepared for your observation. First, have a pre-conference with your admin. A conversation with your administrator can help you know what they are looking for in the observation. This meeting doesn’t have to be formal, so look for any opportunity to talk. The best solution is to find the time when you will have a few minutes for discussion without distraction. Ask any questions that you might have, and don’t be afraid to request information about the observation. Is there anything specific that he or she will be looking for? Or maybe he or she is really excited to see you implementing your Morning Routine that you planned just once for. Knowing what admin is looking for and wants to see is important. If it is a formal meeting, take your daily schedule, classroom rules, and a draft of your upcoming lesson plan or a basic idea of what you want to teach for your observation. A proactive move is to suggest times for your administrator to pop in. This is helpful to admin so they can see an actual lesson, and not students finishing up an activity from a previous lesson. If you have certain aspects of your classroom or the lesson that you’d like feedback on, let admin know. Giving your administrator items to look for is a proactive and positive way to let him or her know that you are wanting to be the best teacher possible for your students. Choose a topic or academic area that you feel is your strongest. The best thing that you can do is pick a topic that you know well. Being comfortable with the subject matter will ease your nerves and increase your comfort in front of the classroom. Also, choose a topic that is appropriate for the observation. If the administrator expressed interest in observing a lesson on a specific subject, then make sure to accommodate those requests. Keep it simple. One of the biggest mistakes that you can make is trying to cram too much into a 45 – 60-minute lesson. Stick with the lesson plan structure that is familiar, rather than trying on something that is different or new. Don’t try to show off during the observation. Instead, focus on the activities that will support the needs of the students and show that the kids are actually learning in the classroom. This last tip may seem like I’m preaching to the choir, but one of the challenges of being in a Special Education classroom is the various skill levels among the students. It is important to differentiate the topic and design the lesson plan to meet the needs of every student (I know you do this already though!). Include elements of the lesson that cater to every learning style, including hands-on activities, visual learning, audible discussion, and more. Know that you can easily implement fine motor skill practice in to any lesson, too, and directly correlate the skill to your state’s standards. Since you are in a Special Education classroom, there are many other people available to support your lesson, like your classroom paraprofessionals. Make sure that everyone is “on the same page” before the administrator arrives. Consider talking to your paraprofessionals a day or two in advance so that they are familiar with the lesson plan and can offer assistance as needed. Planning includes preparing outside of school, too, so that you are well-rested on the day of the observation. Be careful to avoid late-night lesson planning the night before the observation. Limited sleep could result in subpar performance during your observation. Get to school early that day of your observation to make sure that all of your ducks are in a row. The administrator will want to see the plan that you prepared, so be ready with a copy of the lesson. Reading the information that you planned will make it easy for them to follow along. In addition to copying your lesson plan for the day, make sure you have all of the copies you need for the lesson… and some. You are hoping that everything will go according to plan. But, be ready to adjust as needed. The backup plan will give you something to fall back on if you are short-staffed or encounter problems on the day of the observation. Even if you don’t use the backup plan during the observation, you will have an extra lesson ready to go. Last, but certainly not least, let you students know that a visitor will be coming into the classroom today. It will be important to review with students the appropriate and inappropriate school behaviors. A social skills sorting activity, like the one pictured above, is a quick activity that serves as a great reminder for students… and based on student responses, you can use it as a quick reference for behaviors to look out for or have admin watch out for during the lesson. Remember: these observations are designed to help you become a better teacher. It’s not about being perfect during the observation. Instead, the goal is to show that you are creating an environment to foster growth and learning. The classroom is never a predictable environment, so expect that things might go wrong. Students could come in late or disrupt your flow, or you could run into technical issues or problems with the equipment. Be ready to roll with the situation and maintain a positive attitude along the way. Work hard to show your best skills when the administrator is in the room. After the observation, be open to constructive criticism. You can learn from this experience to improve your performance for future lessons. 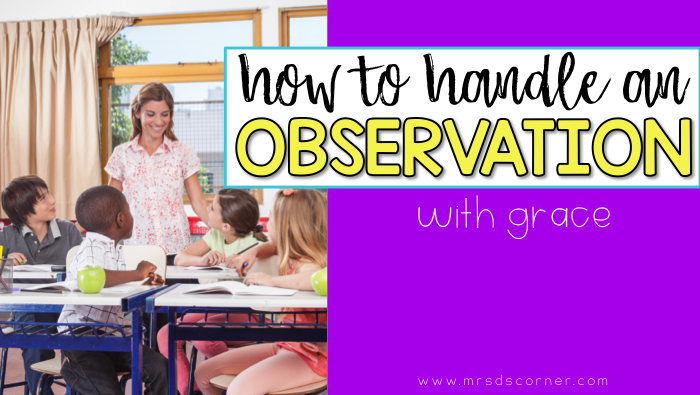 Very good ideas for the dreaded observation. 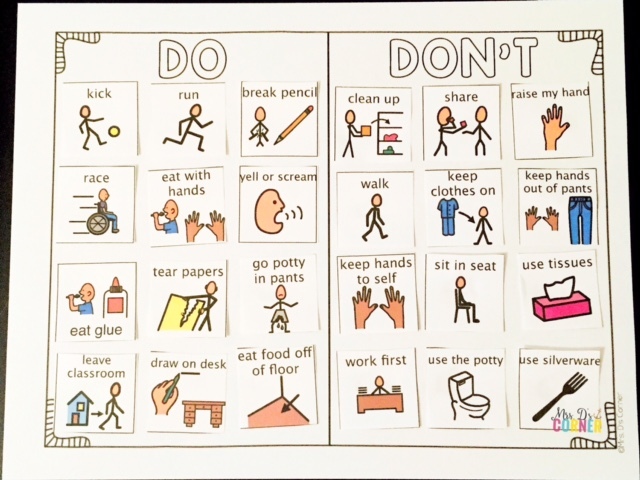 I especially like the Do – Don’t social skills sorting activity!